As I'm sure you all are fully aware by now - I mean, Elton John is, so why wouldn't you be - John Jorgenson is one of the world's most outstanding musicians. Although best known for his guitar work with bands such as the Desert Rose Band and The Hellecasters, Jorgenson is also proficient in the mandolin, mandocello, Dobro, pedal steel, piano, upright bass, clarinet, bassoon, and saxophone. Indeed, whilst a member of the Desert Rose Band, Jorgenson won the Academy of Country Music's "Guitarist of the Year" award two consecutive years. Further more, the aforementioned Elton John is quoted as saying that Jorgenson "is a brilliant guitarist." 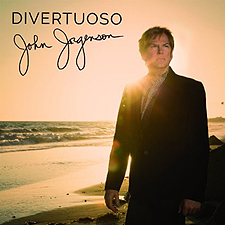 As if to prove Elton John correct and to showcase his extraordinary musical talents quite like no other musician has dared to in the past decade, Jorgenson's just-released Divertuoso (out now on Cleopatra Records) is a 3CD Limited Edition Box-Set, that includes three (3) NEW albums: Gypsy Jazz, Bluegrass and Electric Inspiration. On the third, and final album of this new trilogy from Jorgenson, the man goes it alone; well, solo electric, as they say, under the banner of the Electric Band, on Gifts From The Flood, a mesmerizing electric set that will have you smiling ear to ear. Oh, and as for those "oddly-named" song titles, well, each one was (creatively) named simply after the guitar that was used to create it! Totaling 40 tracks in all, Divertuoso - which, I'm sure, every other artists who released a 2 to 3 CD set wished was a title they themselves had chosen to use! - showcases Jorgenson's incredible virtuosity as both a musician and songwriter in a variety of styles. Here, Jorgenson plays 12 instruments on the box set (acoustic guitar, electric guitar, mandolin, bouzouki, clarinet, mandocello, soprano sax, bass, hammond organ, bassoon, keyboards, percussion), as well as sings. Oh, and he also composed a majority of the material, of course! This release is a singular accomplishment not only for Jorgenson, but also for the guitar community as a whole. His mastery of these three disparate styles (gypsy jazz, bluegrass and rock) is on full display throughout these recordings. I mean, come on now, for not only is Jorgenson all this and more, but he is also a generous, and impassioned educator, and all-around ambassador of goodwill wherever he goes - as well as being a first rate composer of brilliant and original music, as you all (now) know. In closing, and to bring full disclosure to this review, Elton John's quote about Jorgenson (see the very beginning of this review) might have a slightly skewed foundation, given that the man played lead guitar in Elton John's band for seven years, BUT, that said, Jorgenson is that good, truly; honestly!